Visual6502.org: Happy 35th to the 6502! 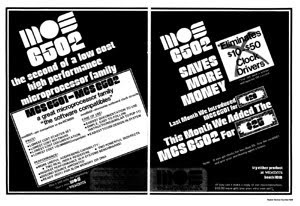 Ad for the 6502 at WESCON, San Francisco, September 16-19, 1975. That good-old friend the 6502, exactly as old as I am (I'm from 1975-09-12). What an ultra-cool project. It's something you think of as theoretically maybe feasible, but you just did it! I had an *analogue* pong as my first "TV game". You kept the scores manually. I opened it once and discovered only resistors, a few capacitors and maybe a handful of transistors. I'm not sure if that has survived, I'll make pictures if I find it.